One central database for all your research participant interaction. Upload a CSV or dynamically sort and filter segments based on screener responses, incentive payment history, and much more. Full control over how and where P.I.I. for research participants is stored. Easily construct filters from any screener question ever, or any CSV upload ever. Add boolean and/or logic, and save the whole thing as a Segment for easy future use. Easily save any combination of filters for you or your team to use. They update dynamically, so within seconds of someone filling out a screener or uploading a CSV, if they match your segment criteria, they will appear. How do people get into the pool? Sources. You can use anything from a global research opt-in page to a recruiting agency to an existing Qualtrics survey to an Ethnio web intercept. See all those sources in one place. 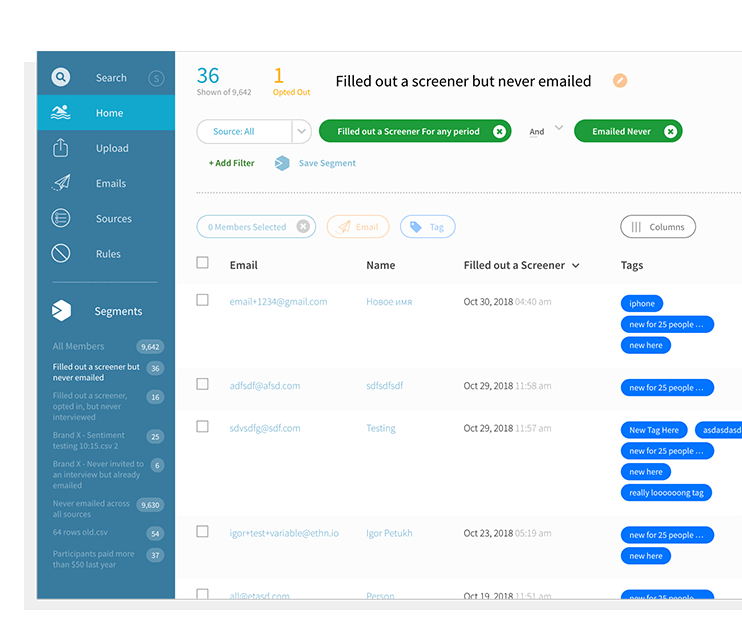 Using email as the unique identifier, Pool tracks and unifies all responses and opt-outs in one place. House and manage your research panel with flexible workflows for your researchers, stakeholders, and vendors, all while staying in compliance for your organization and industry. Go, re+ops, go. Compliance, reporting, and governance - set data expiration, manage P.I.I. Work with your marketing, customer success, sales, or engineering teams to take their lists of participants and get them into Pool for research invites, scheduling, tracking, and payment. Send emails to pool members from a segment or selection and personalize every aspect. You can even choose a random subset, or the first block out of any selected group. Pool tracks every type of activity in other parts of Ethnio and lets you filter and segment based on any past scheduling, incentive, or screener response data. Want to transmit via SSL? Ethnio supports whatever protocol you’d like, and we only have access to data stored in your screeners for support issues. We’ve been audited in detail for security by companies ranging from Facebook to Oracle. You can read in detail about our security in this PDF. You probably have multiple sources of opt-ins, maybe some in Qualtrics, maybe a global research sign up form, and maybe some from a recruiting vendor. Get them all in one place and tracked.